We can’t believe it’s already here. The last week of summer! Well, our summer at least. As of next Monday, school is back in session. Even though the boys have missed their friends, I am pretty sure they are not quite ready to give up these care free days. They are not exactly looking forward to early mornings and enforced bedtimes. Not to mention, they will have to put on shirts, and comb their hair! Who the heck has time for that?! But, like it or not, it’s coming. The end is near! For us, and you. What in the world does this have to do with a recipe? Well, I am glad you asked. The beginning of the school year is always a tough transition for every aspect of our lives , even for food. We go from eating whatever we want, whenever we want, to planning and thinking ahead. Not to mention, that we are working with a considerably smaller window of time to make things happen. So, it is always nice when we have a couple things already made in the fridge for those times when we are running a little behind. 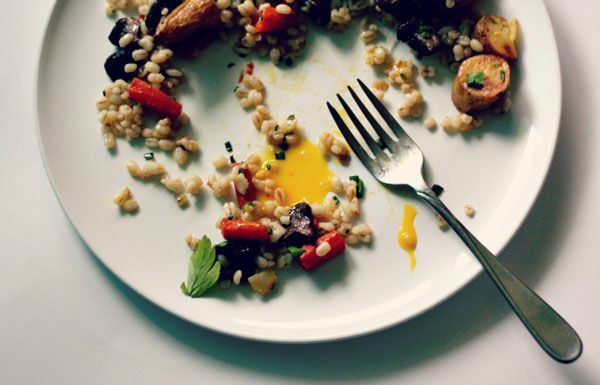 This week’s dish is perfect for that: roasted root vegetable and barley salad. Easy to make, and perfect for any meal. It is hearty, healthy, and full of flavor. Just whip it up, and use it as you need it. Throw an egg on it, and it makes an awesome breakfast. Eat it all by itself as a quick lunch. Warm it up as a side for an easy dinner. Or our personal favorite, eat it straight out of the bowl in your underwear, in the middle of the night. Really, it’s perfect for everything. We might not be quite ready for the end of summer, but with a little planning, we might just survive another year. Preheat oven to 425 degrees. Combine potatoes, vegetables, garlic and mushrooms together in a shallow baking dish. Toss with olive oil and season with salt and pepper. Roast for 45-50 minutes, until vegetable are tender and beginning to brown. Remove garlic, set aside. In a large bowl, combine vegetables, barley, chives. Add dressing 2 Tb. at a time until you reach your preferred taste. 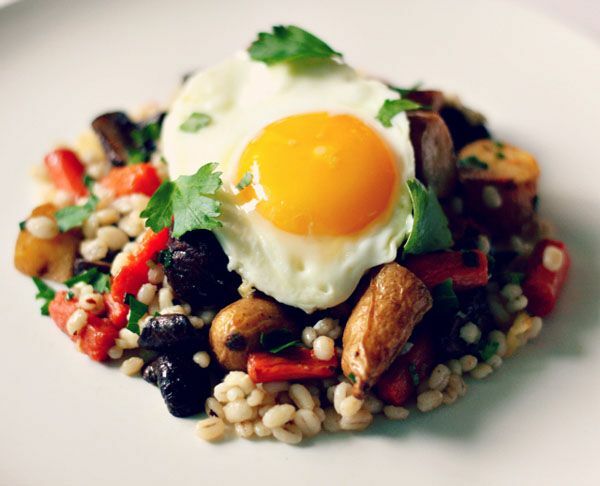 Garnish with parsley (and an egg, if you’re into it). Serve and enjoy! In a small bowl, smash reserved garlic with tines of a fork until totally smooth. Combine vinegar, salt, sugar, and mustard, mix to combine. Whisk in oil until mixture is totally emulsified.